Can anyone tell me what color the green paint the 75' Gran Sport Deluxe was? If not, any advice on how to go about matching it? For instance, what type of paint is it or any other information related to the paint. The paint is exactly like the bicycle on the left. You will have to play mix and match. Buy cans of auto spray paint getting close then start spraying over white or silver base coats. (get metal sheet and prime and section off areas for experimentation) You can buy clear metallic and clear pearlescent and spray over. (some later gitanes had the metal flake/pearl in the clear) I have a Gitane with the same green and looks to be on silver base? offwhite base-clear pearl-light pass silver metal-(Peugeot ref. )-final pass clear pearl-several coats clear. This gets close to pearalescent white Gitane paint of late 80's. Frenchbuilt, did the lower end bikes have that kind of paint, or were they just an ordinary enamel? Hello, if your paint isn't real bad and you just want to touch up, people recommend mixing different colors of Revel (sp?) model car paint, that comes in little bottles at a hobby shop. From sometime in the 1960s until the late 70s Gitane used tinted transparent lacquers over a white, gold or silver primer base. These were not "Metallic" colors as there were no metallic particles in the top coat. In Europe this was called "Flamboyant" paint. In the US it was called "Candy Apple" colors after the thick red transparent lacquer that was used on hot rods and custom cars that were the big thing in California during the 1950s and 60s. The red color resembled Candy Apples. Candy apples on sticks dipped in melted red dyed sugar and then allowed to cool. Do a Google search on Candy Apple Paint. Flamboyant or Candy Apple paint is difficult to apply to get uniform results. On large surfaces such as on cars, it's applied in thin layers and rubbed out between coats. You get problems with paint "running" and rough "orange peel" surfaces on the small diameter tubing used on bike frames. Also, the thickness of the paint determines the lightness or darkness of the color. Thicker paint looks darker. The transparent lacquer is hard to match. 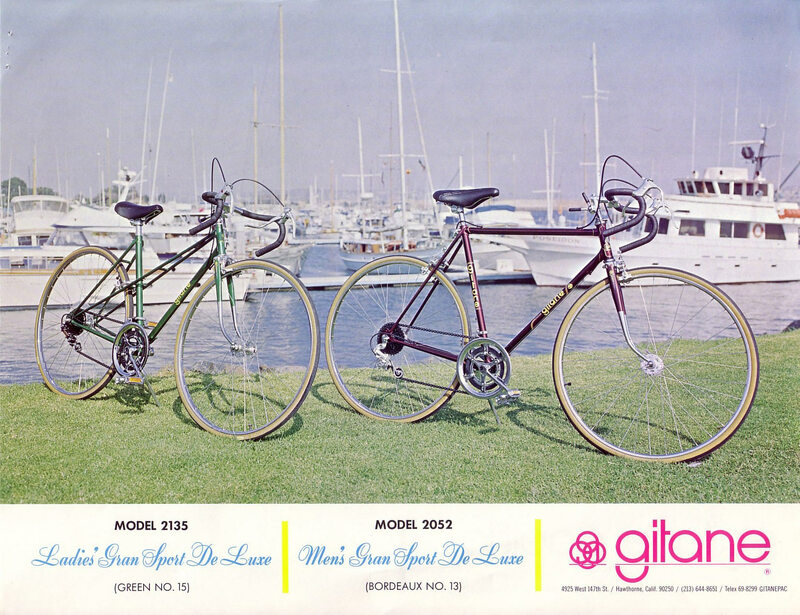 The green used on Gitanes during the early 70s bike boom was called Club Green. It was usually pretty dark. From 1974 on the paint quality on Gitanes was much better. They introduced a lighter green Flamboyant color. The problem with the Flamboyant paints was the lack of pigment. The dyes used in those colors was light sensitive and faded when exposed to sunlight over a period of time; sometimes, just from sitting in a bike shop front window! The solid pigmented colors such as white, orange, light blue and the very rare black where much more permanent. One last point, the entry level and lower end Gitanes were sandblasted with very coarse grit to remove the brazing flux and in some cases excess brass that ran out of the lugged joints. Gitane used a heavy white primer/filler to compensate for the rough finish on the bare metal. The top coat lacquer scratched or chipped off of the base coat very easily. Over half of the the pre 1974 Gitane came out of the box scratched up. To make matter worse, many times there was no protective material between the wheels and frame. The wheels could roll around freely in the shipping boxes. Mel Pinto sent us an assortment of tough up paint that included all of the colors plus stacks of replacement decals. The bikes with Reynolds tubing were sand blasted with finer grit before painting so the metal surface was smoother, the primer/filler base coat was thinner and the top coat adhered better. and trying light passes to let a silver base coat show through, it is possible to get something thats pretty good. In France, auto parts stores have a good selection of model specific spray can colors. I am sure you can find the equal in the usa. You might have to buy several cans and see whats close. I have also used plastic model spray paint (Tamiya). You will be surprised with what can be done by light coats. For the my green bike (if I were to do retouching ) I would prepare a flat metal « try out » support by first light gray/white automobile primer. (spray can) followed by a silver metallic paint and then a very light transparent pass of the close green. Then maybe a light pass of silver metallic on top of this followed by another light pass of green. Sometimes by going fast and not letting time for the various coats to dry blends the coats and possibly a clear gloss coat before everything dries will blend better. If everything seems pretty close, find some tube section pvc plumbing or copper pipe and do the same trail/work out. The round section takes the color differently. even a decal limit can be used. So far, this has worked well for me and with patience, you will be very close. Attached is color chart from Tamiya-maybe a green that is close ? hi, check this. It appears to be transparent!